Explain ways in which designing a performance space with a focus on acoustics can improve audience experience, players’ needs, and the quality of the events held within the venue. Describe how the proper use of glass can be advantageous for improved acoustics. Articulate the challenges and design strategies used for optimizing acoustics within the featured performance and learning facilities. Discuss the range of building products that can be used to create acoustically optimized spaces. From Brooklyn to Shanghai, performance spaces and learning environments benefit from the innovative use of acoustic design solutions to create optimal experiences. This course will look at a number of projects across the globe that have successfully incorporated acoustic strategies—everything from glass products to specialized roofing materials—within the overall design goals. Additionally, the course will highlight the growing role of acousticians in meeting acoustic challenges for given projects. Crafting a space with an eye toward acoustics, audience experience, and players’ needs can heighten the quality and intensity of the events held within its walls. With these three international venues, design considerations for all the senses take center stage. A 300-seat performance space takes cues from the topography of its site. Designing a small performing arts building that would work for both indoor recitals and outdoor concerts, Craig Hodgetts and Hsinming Fung drew inspiration from musical instruments. From cacophony in the schoolyard and tense quiet during finals to the social jungle of the cafeteria and the read-out-loud of Roald Dahl: Maybe no acoustic environment is expected to perform in such a variety of ways as the contemporary school. For nearly half a century, the Royal Conservatory, Canada’s venerable music education institution, has occupied a distinctive late-19th-century masonry building at the northern edge of the University of Toronto campus on Bloor Street, one of the city’s major east-west thoroughfares. The San Francisco Opera has been entrenched at the War Memorial Opera House since it opened in 1932. 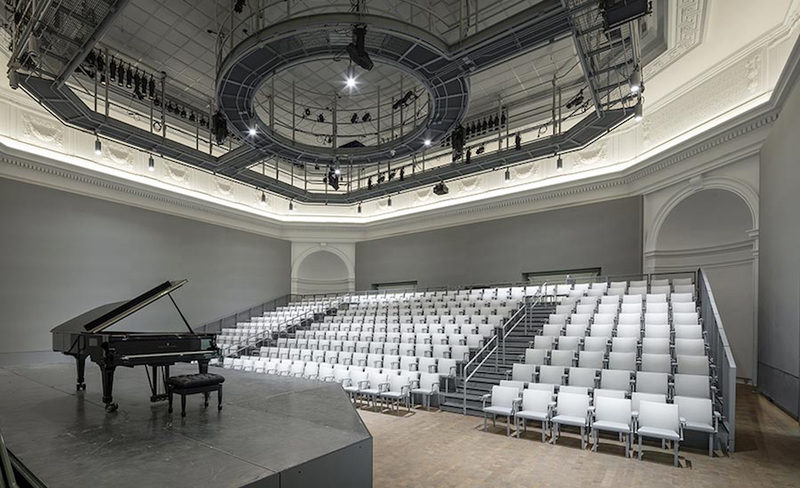 Looking toward the future, the 94-year-old company wanted a secondary venue in which it could mount smaller chamber and avant-garde works to attract the next generation of operagoers.